The de facto standard in software development for the European Defence and Real-Time industries. The CP HOOD toolset is used extensively in many pan-European projects, including Eurofighter – Typhoon, Hawk and Tornado. The HOOD design method starts with an informal statement of requirements expressed as natural text. The user identifies candidates for design objects and operations from this text by identifying nouns (corresponding to objects) and verbs (corresponding to operations on those objects). The CP HOOD toolset provides special editing functions to mark, store and highlight object and operation word lists. The CP HOOD toolset adds to the standard method by providing for requirements capture using CORE notation, with requirements traceability provided through to the generated code. Additionally, as a significant enhancement to the standard HOOD method, candidate objects and operations can be identified in the CP HOOD Toolset from Ward/Mellor or Hartley/Pirbhai dataflow diagrams and from state transition diagrams. A diagrammatic representation of the design, in terms of objects and their inter-relationships, is then created and refined using hierarchical object decomposition. Structured Object Definition Skeleton (ODS) texts are used to specify the interface details of the objects (in terms of Ada types, subprograms, exceptions etc.). The ODS contains the detailed structure of the design which is summarised in the diagram. The textual part of the design is created initially from the diagram, and thereafter the toolset ensures that both diagrammatic and textual information are kept consistent. A structure editor is provided for the ODS texts. The toolset provides extensive on-line help, supports the HOOD Standard Interchange Format and has a dictionary/browser with full report-generation facility. Supports the HOOD (Hierarchical Object Oriented Design) method. Proven, reliable multi-user database access. Provides a Yourdon style SA front-end with Data flow and State Transition Diagrams that can generate HOOD objects and operations directly. Allows requirements capture using a notation that is a subset of CORE, and requirements traceability through to the generated code. Export / Import of HOOD objects. Provides extensive on-line help facilities. Available on Sparc/Solaris, Alpha/OSF UNIX and Linux. Usage of the CP HOOD Toolset has become the de facto standard for the design and development of real-time software using ADA. The toolset is used on many international projects including EUROFIGHTER TYPHOON, HAWK, TORNADO, SEA HARRIER, HUYGENS. The EUROFIGHTER TYPHOON project is one of the largest software development projects in Europe employing 2,000 software engineers building several complex systems. The project mandated the use of CASE tools, specifically HOOD generating Ada. There are over 50 project sites in Britain, Germany, Italy and Spain using CP HOOD with an estimated 600 total users. This project is believed to be the largest technical CASE installation in the world. Many of the user organisations have bought CP HOOD for use on other projects. A clear, easy to understand design notation gives good visibility to the design, leading to obvious and practical specifications. Extensive automated checks performed by the Toolset eliminate a large proportion of design errors prior to coding thus reducing maintenance costs. Automatic application code generation (to ADA) reduces the possibility of inconsistencies between design and code while improving programmer productivity. A combined high level and detailed design database removes the problem of inconsistent documentation. Documentation that can be tailored to conform to most standards is automatically generated by the toolset. Productivity gains of at least 100% in the design, coding, testing and integration phases of a software project are easily achievable by the combination of the CP HOOD Toolset and implementation in Ada. The CP HOOD toolset has brought significant benefits to many members of the European Defence Industry, including BAE EADS, MMS, Aerospatiale, Eurocontrol and the European Space Agency. Extensive, automated checks, performed by the toolset, eliminate a large proportion of design errors prior to coding, reducing debugging and maintenance costs. The automatic generation of application code reduces the possibility of inconsistencies between design and coding, while at the same time, improving the productivity of development staff. Training courses in the HOOD method and toolset are run on a regular basis. CP HOOD comes, with a full maintenance service including periodic updates and telephone hot-line support. TNI Europe specialists are available to provide training and consultancy in the use of the HOOD method and toolset. 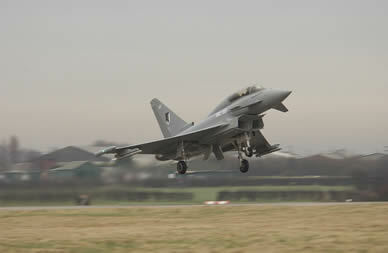 The Eurofighter – Typhoon 2000, or EFA, is arguably the most advanced fighter aircraft ever to take to the skies. Designed to meet the requirements of the four European partner nations, the UK, Germany, Italy ad Spain, it is a single-seat, high-performance, agile combat aircraft which will extend the flight performance envelope further than ever before. High mission effectiveness and survivability are realised through an integrated avionics system, comprising seven functional subsystems, all working together to give the pilot an autonomous ability to assess the tactical air situation and to fight the battle. Such a sophisticated suite of avionics systems has set a new level of complexity in software development, and it is generally believed that the program development for the Eurofighter – Typhoon 2000 represents the largest multi-nation software project ever undertaken. This software development was based on both UNIX and VAX/VMS platforms. The programming language was ADA (from Digital) and XD-ADA (developed jointly by Digital and SD), as a cross compiler to the Motorola 6800X processors used on board. CP HOOD was chosen as the application development tool. The programme to upgrade the RAF’s Tornado GR1 aircraft to the GR4 standard began in 1996 and will extend into 2003. The Tornado GR4 Mid Life Update (MLU) programme introduces new equipment into the existing Tornado GR1 aircraft and effects complementary updates to the avionics systems. Principally affected are displays, controls, on-board defence systems and armament control. These enhancements are accompanied by the introduction of a full avionics data bus, a large increase in computing capacity and an expanding capability to introduce future weapons. Like most other BAE projects, the software for Tornado is developed using the CP HOOD design tool. The CP HOOD design tool is playing a key role in the software development for the Nimrod 2000 project. The Nimrod 2000 order was won by BAE and Boeing in 1997 and involves upgrading the RAF’s fleet of 26 Nimrod MR Mk2 aircraft to Nimrod 2000 standards. The Nimrod mission systems are some of the most sophisticated in use and involve the integration of multiple technologies. Running on General Systems USMS (Utilities Systems Management System) computers, their role is to monitor and control a number of subsystems, ranging from fuel management and gauging to water waste. They utilise in the region of two million line of code. CP HOOD provides the design environment for all software components. Since entering service with the Royal Air Force in 1976, the Hawk has established an unrivalled reputation as a fast-jet trainer, and its success is reflected in sales to fourteen customers worldwide. It operates in extreme environments that range from Finland, in the Arctic Circle, and Saudi Arabia, in the arid Middle East, to Malaysia in the Tropics. By any standard, the Hawk is the world’s most successful fast-jet trainer. The Hawk features a state of the art digital computerised avionics system. The development and maintenance of these software systems is based on the CP HOOD design tool. Founded in 1960, Eurocontrol has, as its most important goal, the development of a coherent and co-ordinated air-traffic-control system in Europe. The organisation is staffed by some 2,800 people, working in five European countries: Germany, Belgium, France, Luxembourg and the Netherlands. The most sophisticated system at the heart of Eurocontrol is ADMAR 2000, installed currently at fourteen sites across Germany. These are served by the ATC centres and are supplied with radar track and flight-plan data over a high-speed (64kb) communication network. AD operators are represented with a complete real-time identified radar picture and flight-plan database for all General (civil) Air Traffic and Operational (military) Air Traffic. This includes a peak of 900 air tracks updated every five seconds. Operators are informed of impending infringements on prescribed separation distances between aircraft. The ADMAR 2000 system comprises a VAX host, driving a number of consoles (usually five) over an Ethernet LAN. The software has been developed in ADA, using an object-oriented design and development methodology, by an analyst team contracted from Data Sciences BV. The tool selected for the design and development methodology was CP HOOD, which was used for all high-level project design. The Eurofighter 2000, or Typhoon is arguably the most advanced fighter aircraft ever to take to the skies. Designed to meet the requirements of the four European partner nations – Germany, Italy, Spain and the United Kingdom – it is a single-seat, high-performance agile combat aircraft that will extend the flight performance envelope further than ever before. The Eurofighter 2000 embodies a design which optimises its air-superiority rile in both ‘beyond-visual-range’ and close-combat scenarios, but which also provides a comprehensive ground-attack capability. The aircraft’s high performance is matched by sophisticated attack, identification and defence systems that include the ECR-90 long-range radar and infra red search-and-track systems, advanced medium and short-range air-to-air missiles and a comprehensive electronic warfare and countermeasures suite to increase further the weapon system effectiveness and survivability. The project is managed through a German-based company, Eurofighter GmbH, with BAE Systems (33%), and EADS (67%)as its partners. The first of seven prototypes made its maiden flight in March 1994, and the aircraft is currently on track to enter service in 2001. Current orders stand at approximately 600 – UK 250, Italy 130, Germany 130 and Spain 90, with outstanding potential for further export orders. The Eurofighter 2000 mission suite. Eurofighter is capable of air combat manoeuvres not possible in previous fighters. This is achieved by a design that is intentionally unstable to provide extremely high levels of agility, reduced drag and enhanced lift. However, this unstable design means that the aircraft cannot be flown by conventional means, and the pilot must control the aircraft by a sophisticated, computerised ‘fly-by-wire’ system that is quadruplexed for 100% reliability. High mission effectiveness and survivability are realised through an integrated avionics system, comprising seven functional subsystems – all working together to give the pilot an autonomous ability to assess the tactical air situation and fight the battle. Needless to say, such a sophisticated suite of avionics systems sets a new level of complexity in software development, and it is generally believed that the program development for the Eurofighter 2000 represents the largest multi nation software project ever undertaken. This software development was based on both UNIX and VAX/VMS platforms. The programming language was ADA (from Digital) and XD-ADA (developed jointly by Digital and SD) as cross compiler to the Motorola 6800X processors used on board. CP HOOD was chosen as the application development tool. Organisationally, the different software suites are the responsibility of the lead contractor, with all other contractors providing supporting personnel, thus creating joint development teams. For example, BAE Systems was the lead contractor for the Avionics suite with EADS responsible for Flight Control Systems. Such an organisation made a methods based approach essential for both development and in-service support. The establishment of a common environment (where all software, including subsystems, has been developed using a common tool) has meant that the integration of all components and subsystems has been relatively straightforward.